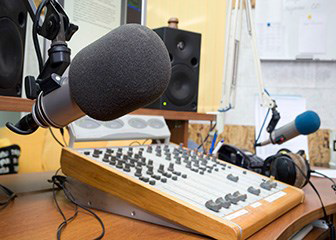 We can provide systems integration for a full Radio station. From a small recording studio, all the way to a fully fledged, automated radio station. We can integrate, control rooms, automation systems, recording systems, dubbing studios, music production systems and so on. From planning shows to populating the playlist to selling spots and scheduling, all the way to production, post production and transmission we do it all. Radio news production is very specialised and it takes experience to design a system properly. Audio files need to be played out in a sequence if the show is not live. So, we design systems which are mostly automated (Even if they sound like a live show). We work with numerous automation systems to control all the various devices in a Radio studio. be automated. Even the production console is controlled by automation. This results in very little manual intervention. This helps in keeping the running cost low – thus helping the bottom line. Audio files need to be archived after playout. We design an automated HSM system which helps archive all the files periodically – thus reducing the workload and clearing the disk space for the next recordings. We work with many of the leading brands like – Studer, Yamaha, AKG, Soundcraft, Harman, Rohde & Schwarz, Tieline, Nuendo, RCS, Dalet, Radio-active, Axel Technology and so on. ► From system design all the way to installation, commissioning and training. ► Any Radio system starts from planning the weekly, daily schedules. Once the schedules are planned, the individual shows can be planned. The in house production will produce the music, jingles, promos and shows. When the productions are complete, the songs, music, news will be ingested to the asset management. The Automation system play list will be populated with the music, advertisements, songs, jingles and so on. ► News will be produced on a daily basis. 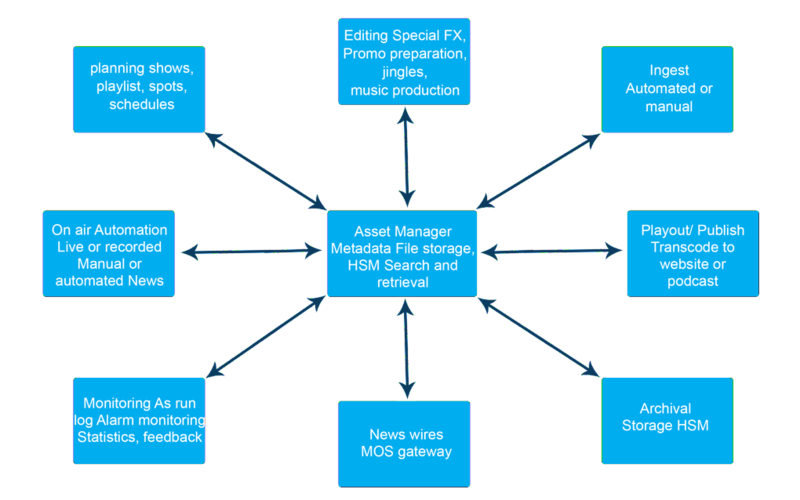 The recorded bytes will be ingested into the asset management. The international news wires will come via the MOS gateway. The sound bytes will be recorded in the asset management. The news producer will send the text to the prompter and the stories will be scheduled. The news anchor will read from the prompter and play the sound bytes from the asset management. ► The shows will then be identified with the selected metadata identifier. The scheduled shows will be played out one by one by the automation system. ► At the end of the day, the automation system gives an as run log. This log is checked against the advertisement schedule. Once it is matched the billing happens. ► The central storage needs to be cleaned periodically. The files will be sent to the archival for storage. They will remain on the main storage for a period of time (so they can access easily). After some time, they will be sent to deep archival - either manually or automatically. ► The system is designed in a way that it can easily be maintained. Alarms are triggered if something goes wrong. We sell all kinds of equipment related to radio. Starting from a small microphone all the way to transmitters, we have a large number of brands to offer. We supply, install, commission and provide after sales support. We provide great prices and on time deliveries. Some of the equipment that we can supply are : microphones, audio mixers, audio editing systems, audio monitoring, professional headphones, music production systems, audio servers, audio players, audio streaming systems, sound recording equipment, audio surround sound systems, studio acoustics, radio automation systems, and AM / FM transmitters (with accessories)..